Why choose Seedhouse feed over pellets or straight grain? Pellets are highly processed and move too quickly through the chicken’s digestive system to enable optimal nutrient conversion of the feed. Pellets also lack a range particle size and texture, which is needed for the chicken’s gizzard to function at its best. Poor gizzard function leads to reduced acid production in the chicken’s digestive system, sub-optimal feed conversion and poor gut health, often seen in chickens having “loose” droppings. Although some whole grain content in feed is beneficial to gut health, straight whole grain feeds often lack essential amino acids, vitamins and minerals. They can also lead to an incomplete diet for the entire flock as the dominent birds will tend to get the best grains first. Essential Amino Acids – why are they so important? Amino acids are the building blocks of protein and essential for cell growth and repair and egg production. Chickens unlike ruminants (i.e. cows) do not have rumen bacteria in their gut to manufacture amino ac- ids, so it must be provided in their diet. 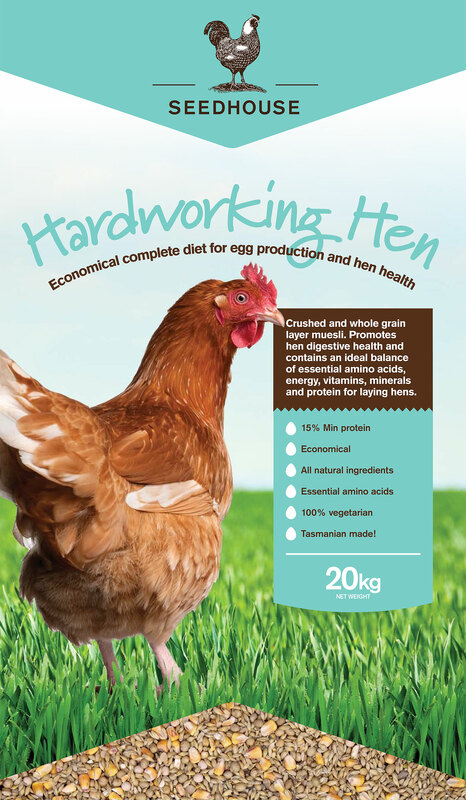 Seedhouse Hardworking hen and Classic hen are complete feeds that are specially formulated to supply the correct balance of amino acids, protein, energy and vitamins and minerals.  All Seedhouse feeds are cleaned of dust to ensure a premium product, you will however notice that there are fine particles in many of our feeds. Please don’t remove the finer particles from your feeder, they are an essential component of the feed. Chickens will seek different particle sizes at different times to suit their nutritional requirements, finer particles are equally as important as larger particles to achieve optimal chicken health. If you notice a large amount of fine components in the bottom of your feeder, don’t refill your feeder immediately give you chickens time to eat the small feed components. If you notice any reluctance from your flock switching to a new feed, try introducing our feed into their ration gradually, mixing a bit of the old feed with the new. But don’t worry if they take a bit of time, they will eventually thank you for the improved diet! What does all this mean for the chicken owner? 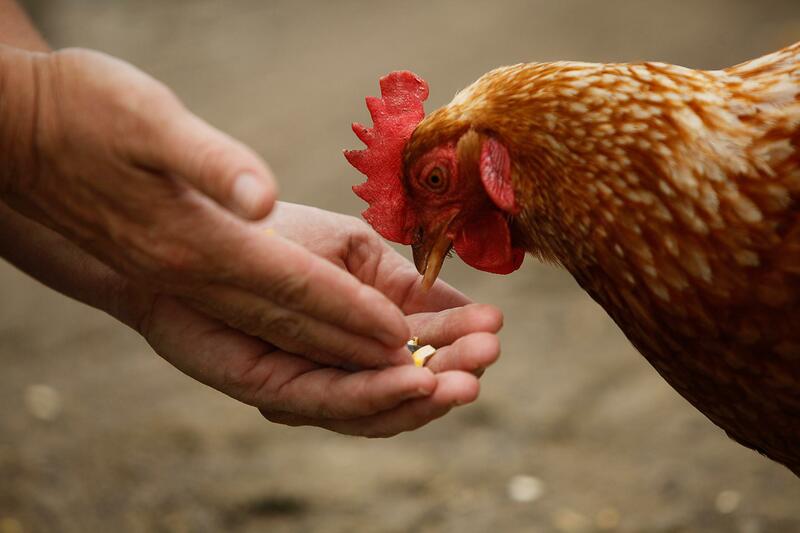 Seedhouse feeds have been formulated by an experienced nutritionist and are locally produced in Tasmania to provide the freshest and best possible feed for healthy, happy and productive chickens. Seedhouse feeds contain no restricted animal material. Seedhouse have provided a range of feeds, so you can pick the best feed option for your chickens and budget. Well balanced feeds are more economical for owners as chickens do not over-eat to compensate for missing nutritional elements. Seedhouse feeds are interchangeable, as chickens are habitual and visual feeders they can find it a disruptive to have their feed changed. 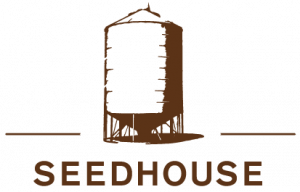 Seedhouse feeds share core components in their feed so they can be readily interchanged across the range with little disruption for chickens. For example owners wanting to give their chickens a bit of a boost before laying can interchange the economical Hardworking hen for the premium Classic hen with little disruption. Formulated from a selection of the following ingredients: wheat, triticale, barley, peas, limestone, canola oil, dicalcium phosphate & soymeal. Macro Minerals: Calcium (Ca), Phosphorus (P), Sodium (Na), Chlorine (Cl), Zinc (Zn), Copper (Cu), Iron (Fe), Manganese (Mn), Iodine (I), Selenium (Se), Cobalt (Co). Seedhouse Tasmania is the first feedmill in Australia to offer a chick starter and grower feed that utilises a new plant extract to comprehensively reduce the impact of coccidiosis in young poultry. The extract primarily derived from oregano is FDA approved and in trials globally reduced the reliance on antibiotics in commercial and backyard poultry. 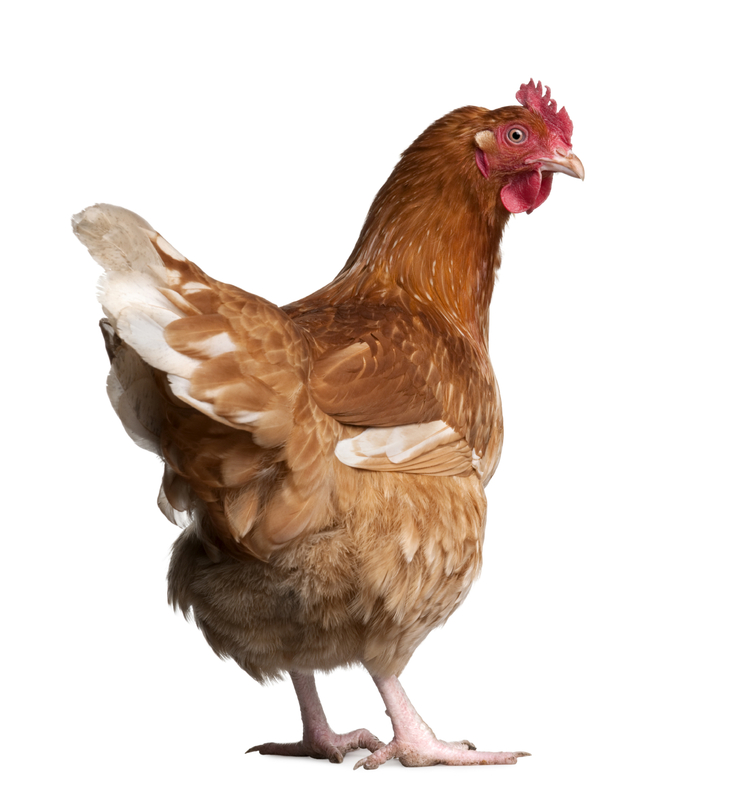 Coccidiosis is one of the most prevalent and costly diseases in poultry. It is probably the most common cause of mortality in young birds. Coccidiosis is caused by a parasite that attacks the animal’s gut wall, it can affects birds of any age but is most destructive in chicks under 3 weeks of age. Birds develop a natural immunity over time but many birds die fairly suddenly at a young age before they have had a chance to develop an immunity. Seedhouse Tasmania chick starter and grower contain Orego-Stim and ENTX, these plan extracts have been used and trialed extensively in Europe, to maximize flock health without the previous reliance on antibiotics. Formulated from a selection of the following ingredients: wheat, triticale, barley, peas, lupins, limestone, canola oil, dicalcium phosphate & soymeal. Seedhouse Tasmania is the first feedmill in Australia to offer a chick starter and grower feed that utilises a new plant extract to comprehensively reduce the impact of coccidiosis in young poultry. The extract primarily derived from oregano is FDA approved and in trials globally reduced the reliance on antibiotics in commercial and back-yard poultry. Coccidiosis is one of the most prevalent and costly diseases in poultry. It is probably the most common cause of mortality in young birds. Coccidiosis is caused by a parasite that attacks the animal’s gut wall, it can affects birds of any age but is most destructive in chicks under 3 weeks of age. Birds develop a natural immunity over time but many birds die fairly suddenly at a young age before they have had a chance to develop an immunity. 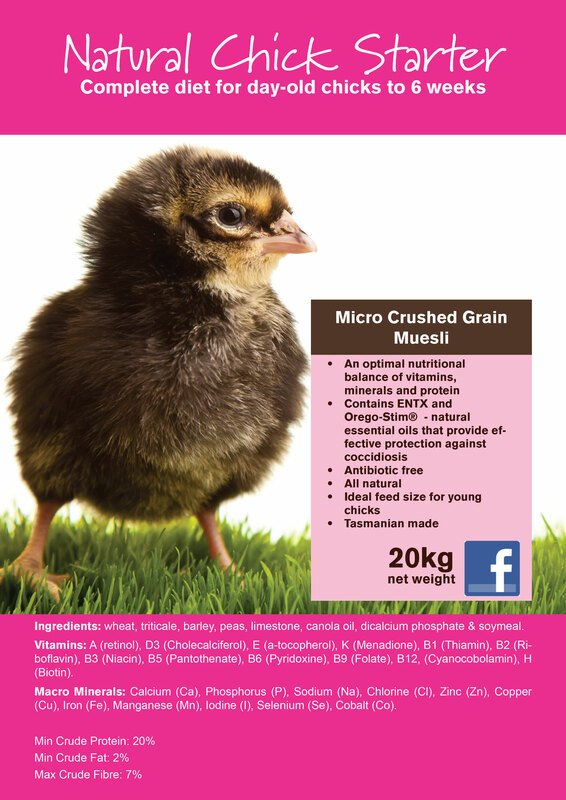 Seedhouse Tasmania chick starter and grower contain Orego-Stim and ENTX, these plan extracts have been used and trialed extensively in Europe, to maximize flock health without the previous reliance on antibiotics. Classic hen is a premium complete diet, 17% protein, 100% natural ingredients, and is an optimal nutritional balance of essential amino acids, energy, vitamins, minerals and protein for laying and breeding hens. This product is proudly endorsed and tested by Devonport Poultry Club. Formulated from a selection of the following ingredients: wheat, barley, triticale, peas, lupins, sunflower, sorghum, corn, canola, shell grit, limestone, dicalcium phosphate, vegetable oil. Vitamins: A, D3, E, thiamin (B1), riboflavin (B2), niacin (B3), choline (B4), pantothenate (B5), pyridoxine (B6), folate (B9), cyanocobalamin (B12), biotin (H), menadione (K). Minerals: calcium, phosphorus, sodium, chlorine, zinc, manganese, selenium, copper, iron, cobalt, iodine, molybdenum. Natural Hen is formulated especially for free-range/back yard hens. It is vitamin and mineral dense to provide ideal nutritional support for a free-range diet. Sunflower, sorghum, corn, canola, shell grit, limestone, dicalcium phosphate, vegetable oil. 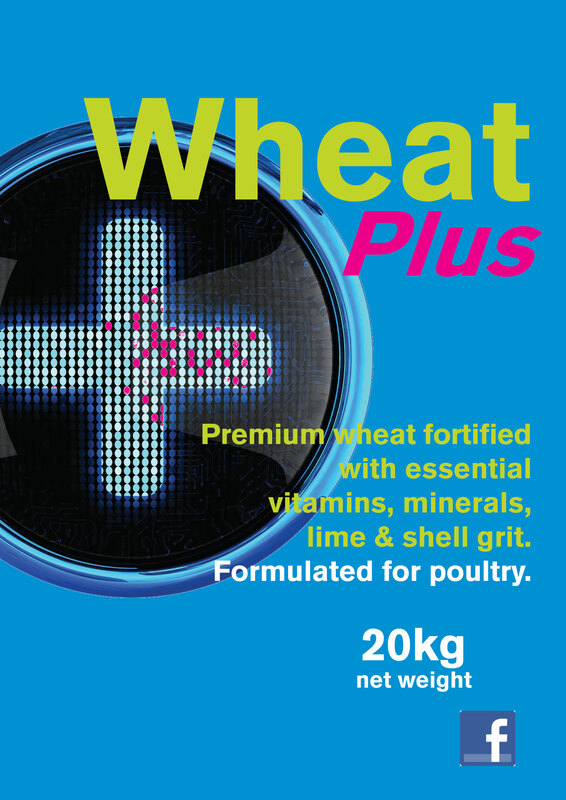 Premium wheat fortified with essential vitamins, minerals, lime & shell grit. Formulated for poultry.